As a bramble of tortuous thorns entangles the finger, the Passion Ring sheds crystalline tears of bloody garnet. 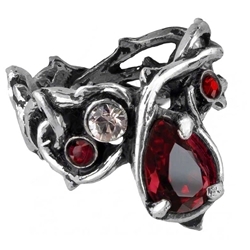 This beautiful ring is made from quality materials and features a natural design tempered with pseudo-gothic styling. Made from quality pewter, this ring looks like a series of thorny, overgrown vines that have gradually begun to entangle and grow together. The focal point of the ring is the large, teardrop shaped Swarovski crystal set in the front. Colored a vivid garnet, it looks like a crystalized drop of blood, shed from these cruel thorns. Three smaller Swarovski crystals also decorate the face of this ring. One is translucent and clear, a single pure crystal amid the tangle of vines and garnet, while the other two match the deep shade of the main crystal. Is it the thorns of the Passion Ring that weep such bloody tears, or does the ring cause those to wear it to shed sanguineous humors on its behalf? None can say for certain. But what can be said is that the Passion Ring, despite its crystal tears, is still a very beautiful ring that is perfect for virtually any occasion, formal or casual.